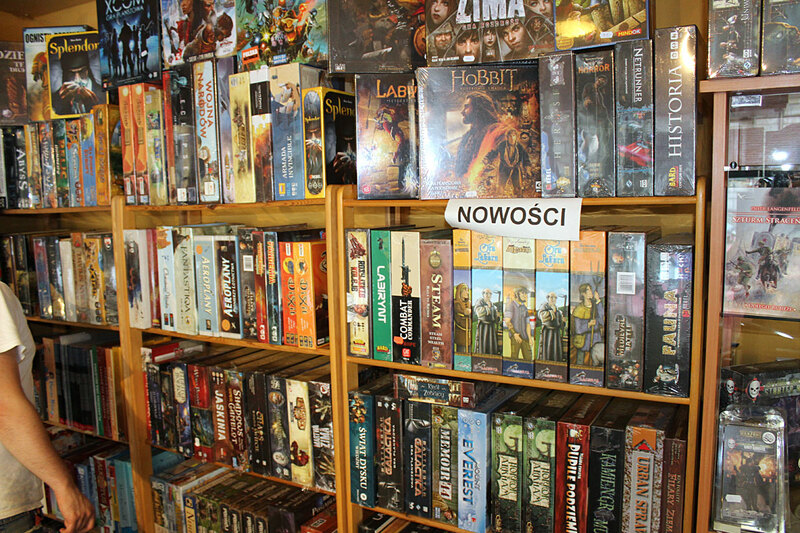 In Warsaw there are plenty of wargaming hobby stores, all scattered around the city. I had opportunity to check only few of them and one conclusion came to my head – Games Workshop almost completely monopolized local market (like whole world:). All stores in the neighbourhood I live, specialize in Warhammer Fantasy Battle and Warhammer 40k. Plus some board and card games and that’s it. In general, I don’t have problem with that. 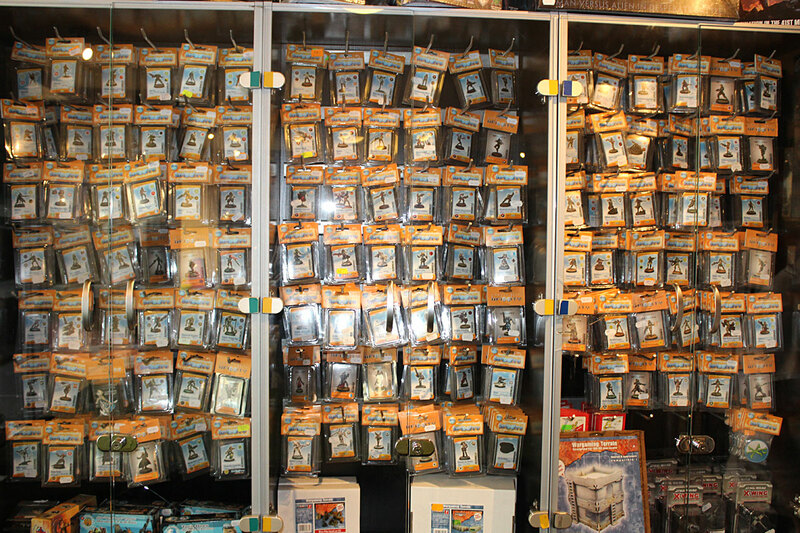 Warhammer fluff is amazing and it’s good folks are into it, but after the visits in some awesome stores in for example Madrid or Prague, when diversity of miniatures offer is stunning – I started to regret there is nothing like that here in Warsaw. It shouldn’t worry me that much – after all almost all my purchases are from online shops and Ebay, but…you know…It’s good to support local businesses and from time to time buy something in old fashioned way:). Recently I ordered all it was needed for my Skaven, Blood Angels and Slaanesh Daemons, so GW products have not that big priority anymore (at least any time soon) – it is going to be months of painting (I feel already tired:). I mentioned few times before I want to expand into other games, and try to paint something different than GW products. I already have some minis from Wolsung, and I started getting models from Malifaux and Infinity. Those are especially awesome and little bit more demanding when it comes to painting skills. Good for me:) I need to make progress after all. After short research I decided Last week to make a short visit in Wargamer store on Wilcza Street 62 in the centre of Warsaw. I was looking for some game systems other than Warhammer. At entrance – unexpected surprise! I was more then happy to find out that currently my old friend Jarek is working there. I haven’t seen him for about a year! We had quick chat, I was in a hurry, but when he noticed my interest in Infinity Game he invited me for demonstration game he was about to play. That was most perfect opportunity for me to visit Wargamer again, ask few questions and make some photos. And of course, btw learn a bit about Infinity:). So…yesterday I spend few hours in Wargamer, watching the game of Infinity and talking with my friend about how everything is going here in Warsaw. The store itself is small, but I am always amazed how everything is well organized in such places to fit all boxes and blisters in so little space. It’s no different in case of Wargamer – cases full of miniatures, accessories, paints, board games and card games. Beside that 3 gaming tables (plus one more in reserve – just in case there are more players or some tournament is organized). 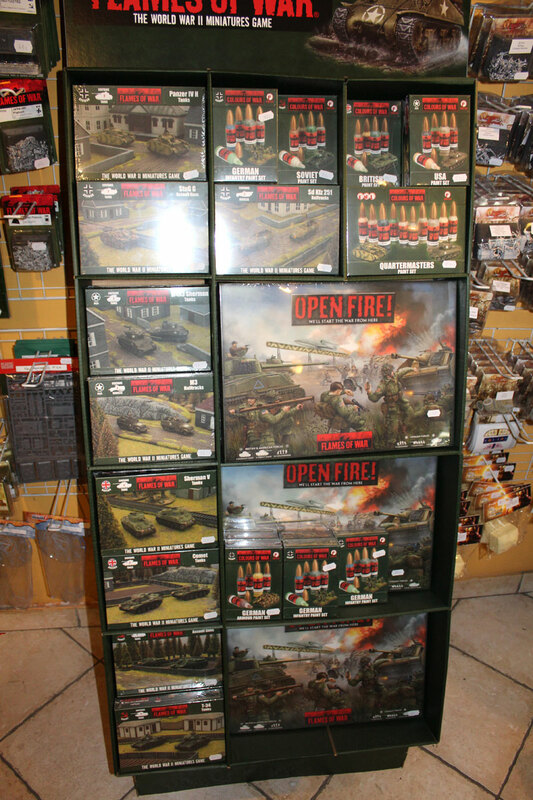 There are many games offered here in Wargamer – Warzone, Saga, Perry, Flames of War (no Warhammer – no surprise – believe me there are plenty of Warhammer specialized stores around – even GW official one nearby. There’s no need to sell more WH in the area). Beside that – we have two major flagship products of Wargamer. The first one: By Fire and Sword – manufactured by Wargamer Company – 17th century historical game focused on struggles between Polish-Lithuanian Commonwealth, Muscovy, Sweden, Crimean Khanate, Cossacks and Turkey. Honestly, entirely not my cup of tea. The scale of 15 mm miniatures doesn’t appeal to me at all, and I prefer more imaginary clashes located in Fantasy or SF environment, but, well, let’s face it – this game is very popular, and not only in Poland. 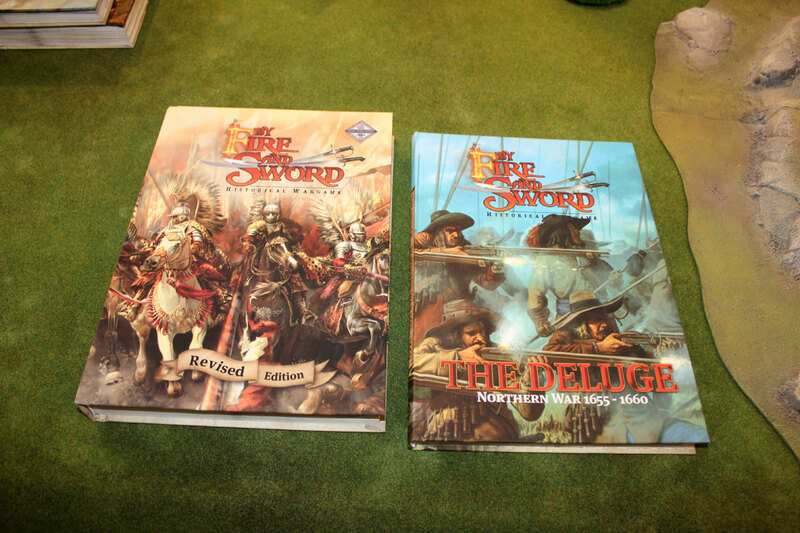 By Fire and Sword is the flagship product of Wargamer Company. Rules are available in Polish and also in English. And now we come to Infinity part. 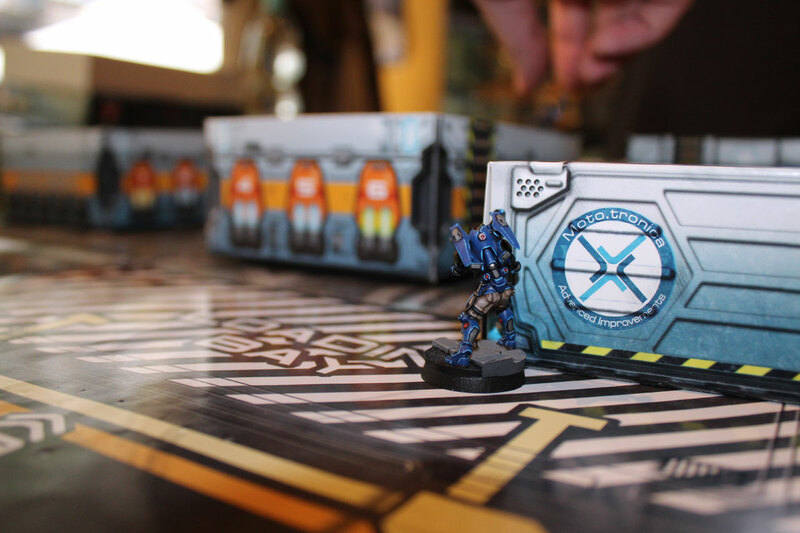 Wargamer offers full range of Infinity miniatures and rulebooks along with bases and scenery pieces from other manufacturers. And the prices are really reasonable – I can tell, because my friend Jarek apparently has high salesman skills and convinced me to buy few boxes (including Bakunin Starter box. Oh, I’m going to paint that soon, oh, yes I will:). There is big community organized around Infinity – not only in Warsaw, but generally in Poland. Leagues, tournaments across the country. In Poland for example, there was organized the second biggest tournament, after Spain – the fatherland of Infinity Game. 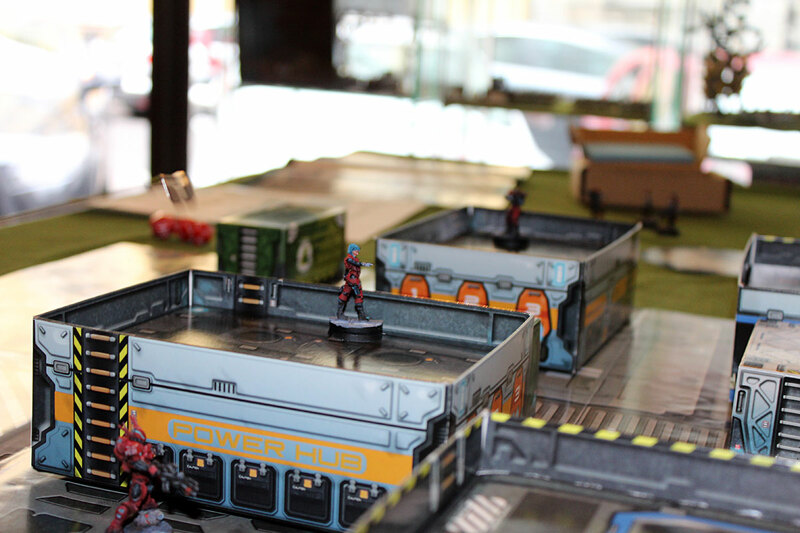 Here in Wargamer there is all it’s necessary to play Infinity – tables and scenery, and full rules support from the staff. Well educated and very helpful:). Perfect meeting place for Infinity players. Infinity showcase ( photo taken trough the glass). I came to Wargamer yesterday, because I wanted to see tutorial game of my friend Jarek. His interest in Infinity is brand new, like mine – it was his very first game. His tutor and opponent – Pat, was good teacher with excellent knowledge of the rules, but he wasn’t merciful at all – he hold the philosophy – learn from your own mistakes. Jarek stood no chance at all here, but he learned a lot. True that (and I, as careful observant, as well:). Infinity Game rules, for me – noob in this field and Warhammer player for many years on the other hand, are really hard to comprehend. 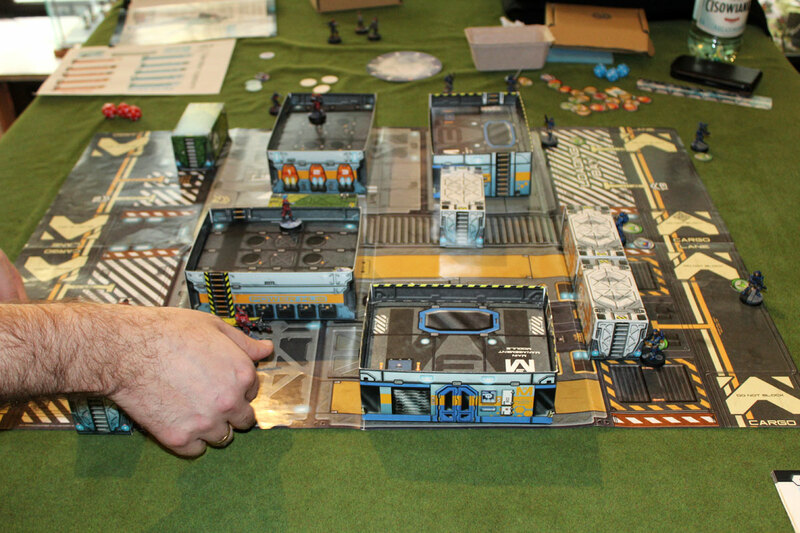 infinity Game tutorial played on the board from Operation Icestorm campaign set. Pat, the tutor, provided the board, terrains and well painted miniatures. Jarek as a new Infinity player thinks about organizing tournament for newbies. Great idea – full support from me. I’ll be painting my minis soon, and eager to try them in the battle against other inexperienced players. In the same time, on the second table – there was the battle of By Fire and Sword. 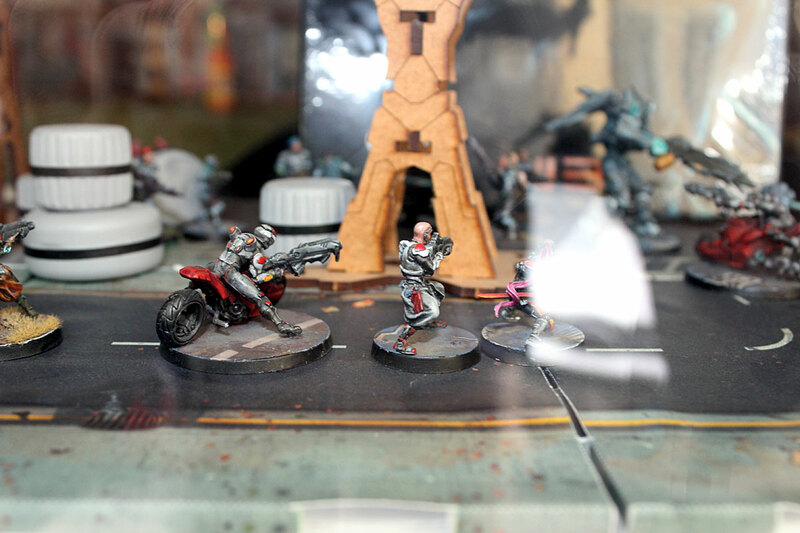 Those tiny 15 mm miniatures are way too small in my opinion, but I must say rules look much simpler than Infinity. Battle of “By Fire and Sword”. I stayed and chatted with Jarek for some time and there were many customers getting in and out – buying minis, asking for board games and looking around. Good. I’m always happy where business is prospering:). It was pleasant visit. I’m glad Jarek is working in Wargamer – he’s dedicated to the hobby – perfect employee. And I’ll be returning customer – Infinity drew my attention for sure and like I mentioned before – the prices are more then fine. And I hope said newbie tournament will be scheduled soon – I’ll be more then happy to participate. Wargamer seems to be busy wargaming community centre for Infinity and By Fire and Sword, and if you are fan of those games definitely the place for you. Bolt Action, Flames of War and Warzone players should also be satisfied. Please take a look also at Wargamer online shop. 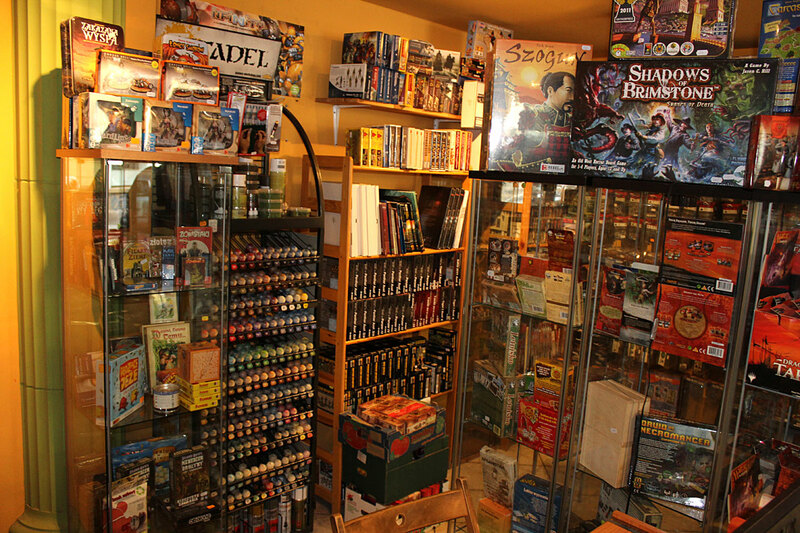 And I forgot to mention (and I should do that at the beginning) the store at Wilcza is a part of Wargamer Company, producer, wholesaler and retailer. 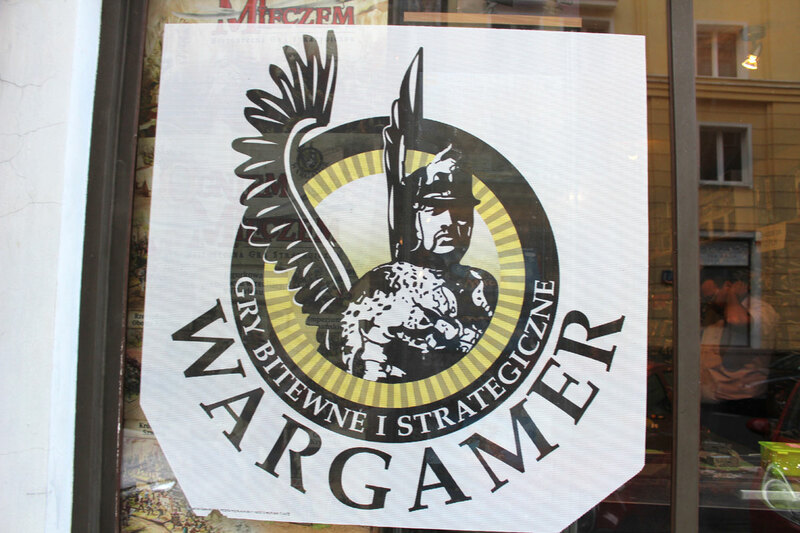 There are two more retail Wargamer stores – in Kielce and Lublin. My Plans for near future: I wish I could say – painting Infinity miniatures, but I have other responsibilities. I finally got bases for my Skaven army, so I’ll start soon Operation Rebasing. Blood Angels are still waiting in line – and today postman brought me brand new bases from Micro Art Studio for them. Great! Back to work! Previous PostLadies and Gentlemen – Ikit Claw! Next PostBases, bases, bases! Lots of bases!